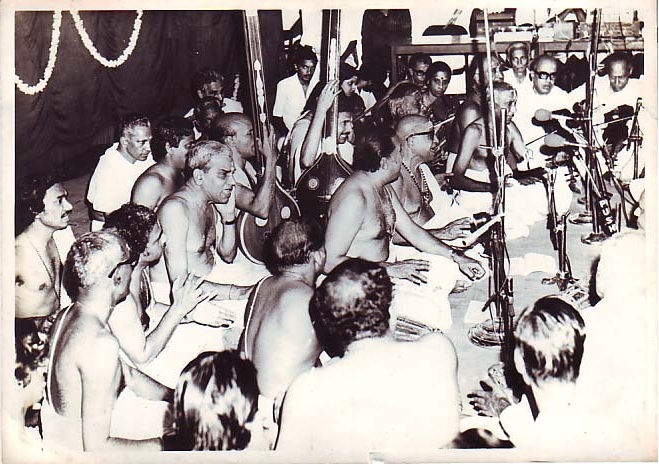 Thyagaraja Aradhana is known to every person associated with South Indian Classical Music and hence needs no special introduction. It is probably one of the biggest musical congregations globally , when musicians from across the globe gather at different locations at different points of time to pay homage to this great bard of Indian Music – Saint Thyagaraja. No other vaggeyakara is as celebrated and venerated as Thyagaraja Swami. In Bharathiya tradition, we don’t refer to the birth and death anniversaries of great personalties so. These are referred to as ‘Jayanthi’ and ‘Aradhana’ respectively. As we celebrate this year, the 252nd Jayanthi and 172nd Aradhana of Saint Thyagaraja, it is important that we contemplate a bit on his life and contributions as well. The life of great men is always a source of immense inspiration and motivation to lead and live completely. Music ,like other art forms such as dance , painting etc.can be called a ‘siddhi’ i.e. a special skill or capability. Demonstrating a ‘siddhi’ creates awe and amazement among the common men which is generally used for earning a livelihood. However, it is from the lives of great personalities like Thyagaraja Swami, that we understand how to use this siddhi to attain God, to earn His grace and not merely making money out of it. That is why he says “ Sangita jnanamu bhakthi vina sanmargamu galade O manasa” i.e. without devotion, the knowledge of music will not lead to the righteous path. Thyagaraja Swami lived that kind of a life – each of his song is a flower offered at the feet of his Lord. In many of his krithis, we find him scorning himself for the different vices he has. A thought might come to our minds – how can such a Mahatma have these vices? Thyagaraja Swami is not necessarily speaking about himself. Instead he is putting himself in the shoes of different people in the world and pleading to Lord Rama to remove the sins and protect him. This makes it suitable for different people having these vices to sing these songs and gain the grace of the Lord. Where else would you see such levels of compassion? Today we sing the songs of Thyagaraja and earn great name and fame for ourselves. But when we look at the life of the great Nadopasaka, he lived on Unchavrithi i.e. begging alms every day from the neighbourhood. That is the way prescribed by the Shastras for a Brahmin and Thyagaraja Swami lived that way. Given his immense capabilities, he could have amassed wealth which he never thought of. However ,historical accounts prove that he abhorred wealth from unrighteous means, he despised singing in courts of kings and wealthy zaminders, he never desired for fame or name. We need to bear in mind that we are talking about a person who lived just 200-250 years ago in the very same land that we live in! We can still walk on the sands he walked; we can go and visit the house he lived in Thiruvaiyyaru, Tamil Nadu. Over the past 38 years, our Thyagaraja Aradhana Trust provides a platform for music students and all devotees to pay homage to this great Saint Thyagaraja by giving them a chance to render a Thyagaraja Krithi and about 500 devotees take part in this five days festival. Needless to mention , we arrange 20-25 concerts by young and upcoming artists along with some senior and well known musicians during the five days celebrations. We take this opportunity to request all music promoters , music lovers and members of the public to donate liberally and also to help us in all ways to make this 172nd Thyagaraja Aradhana Festival a tremendous success.